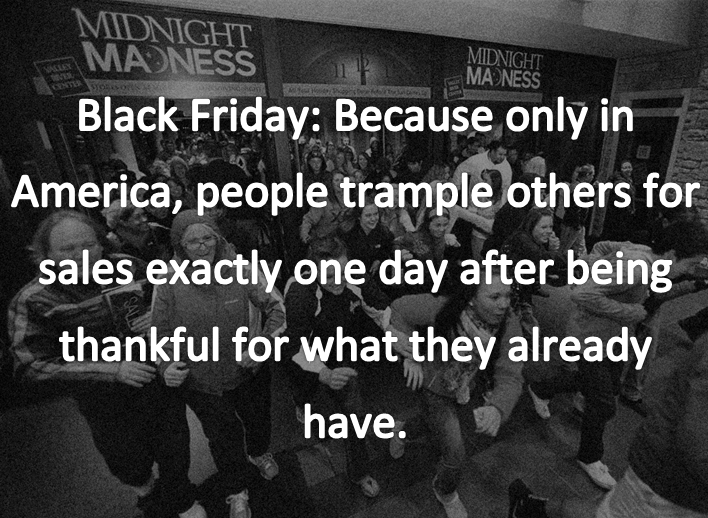 I don’t really understand Black Friday, at all. I like to think I am well-assimilated into US culture, but then I find out that Americans leave their cozy homes the day after Thanksgiving to just go and buy stuff they don’t need, that they can probably get a better sale price on a week before Christmas, when I think all civilized people understand that the Friday after Thanksgiving is one better spent in front of the TV in your workout clothes, eating cold stuffing straight from the Tupperware while your husband devours the last of the pumpkin pie standing over the sink. Then there are naps, possibly a slow walkabout. It is a no-makeup day, a slightly-dirty-hair-in-a-ponytail day, possibly a day to go to a matinee with your children, or get lazy with a book. It is a day to give thanks, thanks that all your family drama from the day before is over, and you can relax. Or not. I spent Friday as a volunteer superstar, at a meeting with two other volunteer superstars, hammering out plans for project after project, making guest lists, writing mission statements, and accomplishing stuff, and after a day of us getting a seriously ridiculous amount of stuff done, I headed home, with a quick stop in to Target to grab some particle board. It was 5PM, and I assumed that Black Friday was pretty much over at that point, and it was – the parking lot was full, but just regular Friday night full, and it wasn’t crowded at all inside, which makes what happened next so egregious to me. There I was, walking up the main aisle to the school supplies section, when suddenly, WHAM! Something huge hit me in the back, hit me so hard it propelled me forward and face-first into a display shelf, which I ended up clinging to, because suddenly my back was on fire and my legs seemed to belong perhaps to somebody else altogether. Luckily, a very sweet older lady saw the whole thing and came running over to me, holding onto my arm and shoulder and asking me if I was okay. She had on a bright pink and turquoise sari, and I just focused on that for a minute, how beautiful it was, and let her lovely accent wash over me while I caught my breath and stood back up. Someone’s grandma was my hero in Target, and that is not an exaggeration. Meanwhile, the guy who hit me, who piled a giant flatscreen tv box into a cart and then rammed it into me so hard that he was knocked backward himself, apparently jumped up, brushed off his pants, and fled the scene without saying a word. What is wrong with people? At 5PM in the middle of a suburban Target, is this the kind of behaviour we have to watch for, now? Who wants a TV so badly that they sprint through Target with one in their cart, desperate to check out as quickly as possible? I was feeling kind of numb from the ribcage down, and also maybe a little in shock, because all I could think about was how sweet this lady was that came to my rescue. Her daughter and grandson came over to get her, and she told them what happened, and they made all sorts of statements of outrage, and volunteered the grandson to drive me home (for real, these people completely reaffirmed my faith in humanity), but I said I was fine, and I said thank you, and said I was grateful to have such nice neighbours, and I went and checked out and walked to my car, and slid into the driver’s seat, and then back said to me, Oh, No. Oh, no lady. No, no, no, no, NO! So I sat for awhile, trying to figure out how I might drive home, since every time I tried to put my foot on the gas peddle it felt like a bucket of glass was exploding in my lower back, and finally I kind of willed myself into driving through the pain and took a lot of sidestreets home, where I poured myself into bed, and that is where I have been, for the most part, until it starts hurting too much to lie down and then I have to sit in my fancy lumbar-supporting desk chair and tell the internet about my woe, I guess. I am pretty woeful, though. There is Much Woe, here. I have a bona fide Black Friday injury. Me! The woman who loathes Black Friday, and everything it stands for. File this under Improbable Events, subsection Rampant Consumerism.